The more powerful 2014 Corvette Stingray C7 gets another shot at the racetrack by setting the pace for another race. Who will be driving the Laguna Blue pace car? When the all-new 2014 Corvette Stingray C7 rolls onto the Chevrolet Indy Dual in Detroit, it will be the second time the GM sports car will set the pace for a race. The first time Jim Harbough drove the 2014 Corvette to pace the Indy 500. 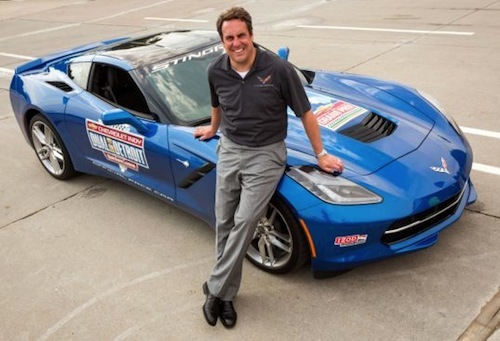 The second driver to get a chance at pacing the field will be General Motors North America President Mark Reuss. The race will take place this Saturday and Sunday (June 1-2). What is this race about? The Indy Dual in Detroit races are part of the Chevrolet Detroit Belle Isle Grand Prix weekend of racing that begins today, Friday, May 31. Reuss will drive the Pace Car for both Indy Dual races. Tony Kanaan who was driving a Chevrolet V-6 2.2L direct-injected twin-turbo-powered IndyCar took the checkered flag for his first Indy win. Kanaan will compete again this weekend to see if he can pull off back-to-back wins. Today, spectators will get the opportunity to take in practice sessions and more at the track without an admission charge. The 2014 Corvette Pace Car will be on display, offering fans an early look at the production model. The Corvette Stingray Pace Car is powered by the all-new 6.2-liter LT1 V-8 from the forthcoming production model that goes on sale later this summer. The new Corvette C7 features advanced technologies including direct fuel injection, continuously variable valve timing and Active Fuel Management to help produce an SAE-certified 460 horsepower with the available performance exhaust system. The 2014 Chevrolet Corvette Stingray C7 coupe gets higher power numbers than were originally estimated by GM. It will have a suggested starting retail price of $51,995 including destination. Look for racing enthusiast and GM North America President Mark Reuss to be behind the wheel of the powerful new Laguna Blue 2014 Chevrolet Corvette Stingray Pace Car this weekend pacing the field.